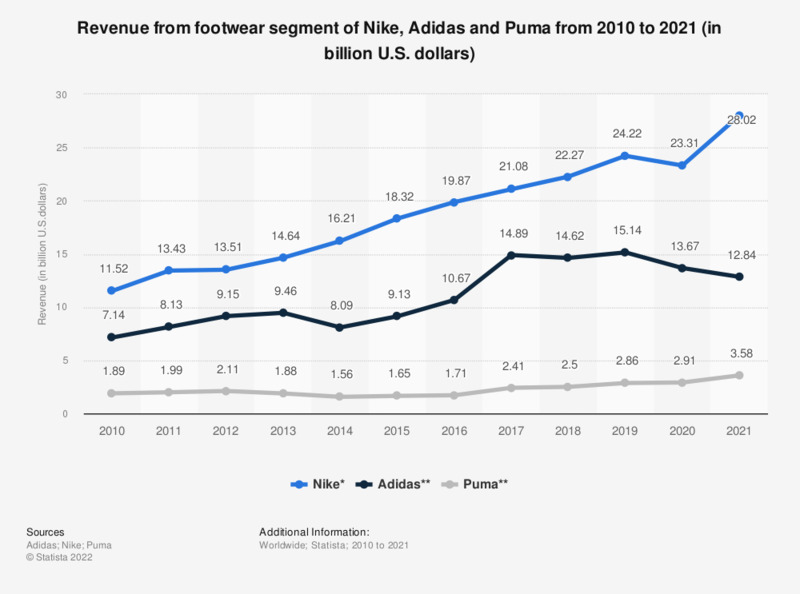 The statistic depicts the global revenue of Nike, Adidas and Puma from their respective footwear segments from 2010 to 2018. In 2018, Adidas' revenue from footwear was 12.8 billion U.S. dollars. Nike is the market leader in the global sports footwear industry, with sales amounting to revenue of over 22.2 billion U.S. dollars in 2018. This figure is larger than the combined footwear revenues of its two closest rivals, Adidas and Puma, who made global sales of 12.8 billion U.S. dollars and 2.5 billion U.S. dollars respectively in 2018. Of Nike’s footwear revenue in 2018, almost six billion dollars was generated in the Europe, Middle East & Africa region and a further 3.6 billion U.S. dollars came from the emerging markets of Asia Pacific and Latin America . However, North America remained the biggest regional market for Nike as footwear sales there reached 9.3 billion U.S. dollars in 2018. In comparison, sales of Nike apparel in North America generated revenue of just under five billion U.S. dollars and sales of equipment was 595 million U.S. dollars. Although it is still behind Nike in the global market, adidas’ footwear segment is growing steadily, with 403 million pairs of shoes produced in 2017, the highest figure to-date. Western Europe continues to be the market in which adidas generates the largest share of it's revenues. In 2017, 29 percent of the company's net sales came from Western Europe. North America is the company's second largest market, with a 21 percent share of adidas' net sales. Owing to the market dominance of Nike and Adidas, Puma’s footwear sales have remained relatively constant in the last few years. However, there has been a spike in the company's footwear sales since 2017, where sales broke the two billion U.S. dollar mark for the first time since 2012. The footwear segment nevertheless remains the company’s biggest earner as sales in its apparel segment stood at around 1.7 billion euros in 2018 and sales of its accessories generated close to 777 million euros in revenue. *PUMA figures come from the company's yearly group management report. 2018's report can be found here. Adidas figures come from the company's annual report. 2018's report can be found here. ** Fiscal year end of May 31 of respective year. Everything On "Nike" in One Document: Edited and Divided into Handy Chapters. Including Detailed References.